An art show in Templin Hall features the work of seven area high school art teachers. The “Artist & Educator” exhibit in the Visual Arts Gallery in Templin Hall opened Nov. 15 and closes Jan. 10, but its effects will last much longer. 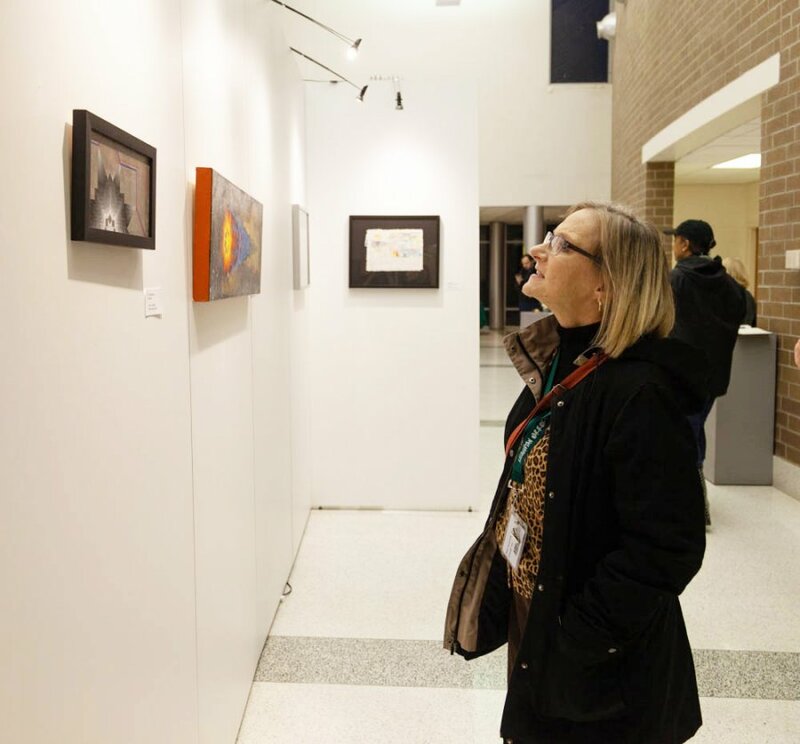 The show, put on by Thomas Nelson's Visual Arts Department, features acrylic paintings, watercolors, photography, ceramics and mixed media pieces by seven art teachers representing Bethel, Kecoughtan, Menchville, Phoebus and Woodside high schools. This is the first time Thomas Nelson has sponsored an event like this, and nearly 80 attended opening night. Josh Ostraff, an assistant art professor at Thomas Nelson, was instrumental in organizing the show. He said events such as this are important to the teaching community. Chris Hakanson, who is in his eighth year as an art teacher at Phoebus, appreciated the opportunity not just to display his works, but for the inspiration the experience provided. Hakanson added all of that, as well as meeting the Thomas Nelson faculty, is beneficial. “It is an important thing for me to not only get my creativity exposed, but to have those other things involved also,” he said. Wheeler noticed the teachers' excitement when they walked in. Hakanson participates in three or four shows a year, which benefits his students as well as himself. Ostraff said the impact shows like this can have on high school students can last years because it helps the teachers be more effective. And it shows that these teachers are aspiring artists also; they practice what they preach. “Teachers have a lot of impact on kids,” he said. “We can have kids come here (to campus), and we can talk to them about programs. But it’s those teachers that will interact with more than we can ever interact with.